A patterned egg rattle, around 900 years old, has been placed on show at Krakow’s Archaeological Museum as Easter approaches. The clay, enamelled egg is 4,9 cm high and has diameter of 3,9 cm. It was discovered in 1881 in Podhorce (now in Ukraine) by Teodor Ziemiecki, an archaeologist from Krakow. 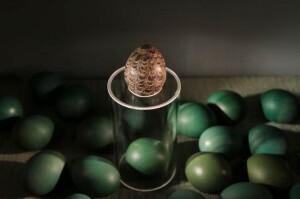 The custom of creating patterned eggs pre-dates the coming of Christianity to the region, and was associated with the Spring equinox. Eggs symbolized fertility and rebirth. The custom of creating Easter patterned eggs (pisanki), typically using real egg shells, is a tradition still widely practised in Poland and Ukraine. It is possible to read the eggs of particular regions – the word ‘pisanka’ itself derives from ‘pisac’, meaning to write. Common symbols include the tree of life and the sun. Krakow’s largest collection of patterned eggs can be found in the city’s Ethnographic Museum, which has some 8,000 examples from various regions. A revolving selection of these can be viewed at the museum.